We had the pleasure of hosting close friends of ours over the long weekend. I had all these exciting adventures planned and none eventuated due to the horrid weather. 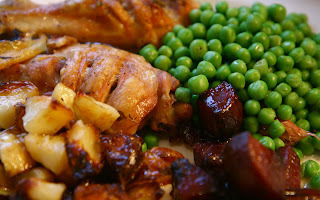 On the other hand, it was so lovely just sitting around the table, enjoying a good meal and chatting through the night. 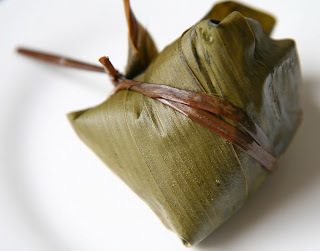 I begged J and A to teach me how to make Zongzi or otherwise known as bak-chan (in Hokkien dialect) or rice dumpling. I remembered my grandmother sitting on the stool and making dozens of these Zongzis. I never learned (wasn't interested in cooking in those days) but I always hung around when the Zongzis were ready to be eaten. 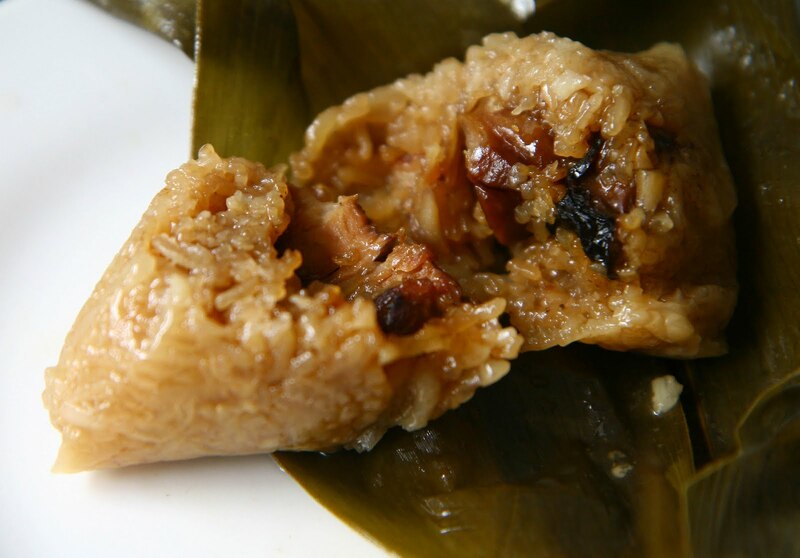 To cut a long story short, Zongzis are eaten during the Dragon Boat festival which falls on the 5th day of the 5th month of the Chinese Calendar. This is to commemorate the death of a patriot and famous poet Qu Yuan from the Chu kingdom who committed suicide by drowning in a river. Zongzis were thrown into the river so that the fish would leave his body alone. Since we're Southerners, our Zongzis tend to be more of a tetrahedral shape. I was a complete disaster at wrapping and tying so poor J and A were left to the task. My only contribution was stewing the pork belly which was used as the filling and of course, *burp* eating the final result. tetrahedral Our bingeing session continued for the next 3 days. Our Sunday menu consisted of corn fed and free range chicken marinated in lemons, whole cloves of garlic, fresh thyme, extra virgin olive oil, sea salt and freshly ground pepper and roasted until it's tender. To accompany the main dish, we had organic beetroot cooked in its juices as well as a dash of extra virgin olive oil, balsamic vinegar, sea salt, freshly ground pepper and a sprinkle of fresh oregano. I then blanched petit pois and seasoned accordingly. As a treat and a promise to exercise twice as hard over the next few weeks, I decided to roast new potatoes and smothered them in goose fat. Our dessert was to be a marble cake which I baked earlier but we inhaled it within seconds after J and A's arrival. but now I have to seriously go on a diet.